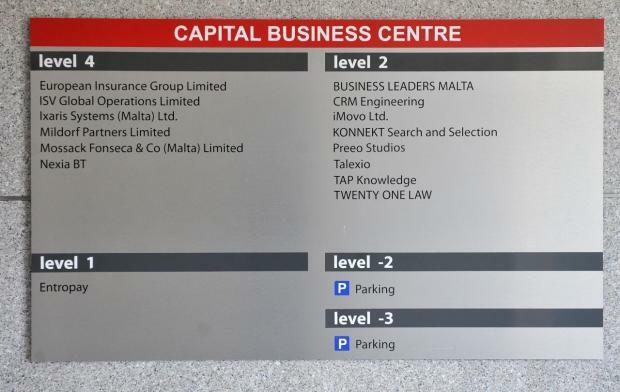 The local office of Mossack Fonseca – the company in the eye of the storm over the Panama Papers leaks – has removed its name from the entrance to its office in San Ġwann, while its sole director has resigned and been replaced. The Times of Malta is informed that Adrian Hernan Dixon Sanchez, who has been in Malta since the opening of Mossack’s representative office in May 2013, tendered his resignation last week. He was immediately replaced by two other directors, Juergen Mossack Herzog and Ramon Fonseca Mora – both residingin Panama. 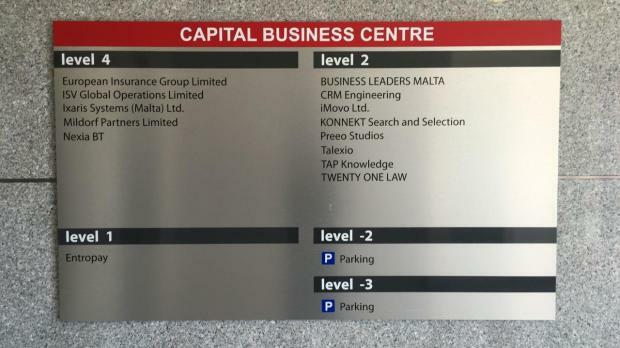 At the same time, the name of the company was mysteriously removed from the plaque at the entrance of the Capital Business Centre in San Ġwann where Mossack Fonseca and Co (Malta) Ltd has an office on the same floor as auditing firm Nexia BT. It is not yet known whether Mossack Fonseca’s local office has been closed down or relocated. Attempts to contact Mr Sanchez yesterday failed but a representative of Nexia BT said when contacted that Mr Dixon was not at his desk at the time of the calls and would pass on the message. Mr Sanchez did not return the call by the time of writing. The representative made it clear that Mr Sanchez did not work for Nexia BT. Meanwhile, Brian Tonna, managing partner of Nexia BT distanced himself from Mossack Fonseca when asked to explain why the company’s name has been removed from the entrance to his offices. Through his lawyer Dr Henri’ Mizzi, Mr Tonna said that himself and his partners had no beneficial interest in Mossack Fonseca. “Mr Tonna’s licensed fiduciary company holds shares in Mossack Fonseca Malta in a fiduciary capacity, on behalf of the ultimate beneficiaries. As a consequence, because of professional obligations, my clients are unable to answer your questions,” Dr Mizzi said on behalf of Mr Tonna. According to MFSA records, BT International Ltd, owned by Mr Tonna, is the only shareholder of Mossack Fonseca Malta Ltd. Both Nexia BT and the local offices of Mossack Fonseca have been mentioned several times in connection with the revelations of the Panama Papers. Both offices were involved in the setting up of overseas trusts and companies in New Zealand and Panama for the Prime Minister’s chief of staff Keith Schembri and minister without portfolio Konrad Mizzi. It was later revealed that Mr Tonna and Mr Schembri also held trading companies in the British Virgin Islands – considered as a tax haven like Panama. The Times of Malta last week revealed that all those mentioned in the Panama Papers leak are currently the subject of a tax evasion probe by the Maltese authorities including the Tax Compliance Unit and the Financial Intelligence Analysis Unit. At the same time, despite deciding to keep both Dr Mizzi and Mr Schembri in office, Prime Minister Joseph Muscat said that he is still awaiting the conclusions of tax audits on their overseas financial vehicles. Both politically exposed persons have failed to declare their New Zealand trusts with the local tax authorities.